This was a challenge, and I loved it. It's a Renaissance play and was written with obvious Shakespearean qualities - blank verse with iambic pentameter - and I was happy to work hard to read and understand what was going on. I think it's what I really needed to get myself back into serious reading. It's a set book for my university course, but it was also one I had been dying to read for some time. Two birds, one stone, etc. Christopher Marlowe was friends with Shakespeare, which attracted me to him. I also read about his heretic comments and his strange death, which made me even more eager to read this play. 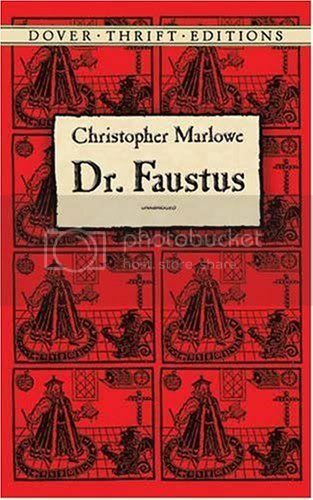 Faustus is an intellectual who feels that although he has studied medicine and philosophy he finds it all a bit of a bore and is looking for something different, something more out there. For this reason, he decides to dabble in black magic and become as close to a God as he can possibly be. This backfires a bit, and he indulges in twenty-four years of pointless conjuring, only to have his soul dragged to hell by Lucifer after his time is up. During this time, he becomes something almost like a court jester – entertaining the rich, and becoming even less of a God than he was in the first instance. He comes close to saving himself many times, but ends up falling into the same cycles of having doubts about the contract, being persuaded otherwise by the powers of darkness, and then convincing himself to see through his agreement with Lucifer. I think Marlowe is subtly expressing his opinions of the church in this piece. Faustus had anti-religious feeling, and I believe this may have been the way Marlowe was feeling at the time also. There are many rumours of his unorthodox opinions, and this was one of them. The concept of belief and unbelief is rife throughout the entire play, with Lucifer and various devils appearing on stage, but God never making a single appearance throughout. I felt the characters to be quite allegorical, with each one representing an abstract idea - such as one of the seven deadly sins. Although this made most characters slightly flat, I enjoyed it all the same. There are so many things I'd love to talk about in depth, but I'd really like to save myself for my analytic essay on this work. However, I'd definitely recommend this one to someone who likes a challenge. It gets easier to understand the more you read, and it becomes enthralling. Marlowe’s points about religion and society are interesting; the whole thing has a breathless feeling to it. I’d ask you to try it. 18 / 72 books. 25% done!